High gloss finishes have been a must-have feature in the trendiest, upscale European homes for years. Now, American kitchens and bathrooms can have that sleek, European look with easy-to-install, low-maintenance high gloss acrylic panels. Lustrolite high gloss acrylic panels from Innovate Building Solutions offer an affordable choice for homeowners who want to add a unique and contemporary touch to their kitchen or bathroom. The colorful, low-maintenance wall panels can be installed instead of tile to give a sleek, sophisticated look to kitchen and bathroom backsplashes, as well as tub and shower enclosures. 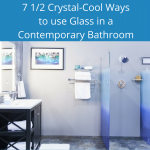 They’re versatile and can be used in a variety of ways to create a stunning accent wall anywhere in the home, to add a pop of color to the kitchen, or for a slick, contemporary look in the bathroom. The panels are made of a high-performance acrylic material that look like back-painted glass but are 20 times stronger. They are half the weight of glass panels and less expensive. The panels come in four sizes for design flexibility with a choice of wide-range of decorator colors including artic white, blue atoll, glacier, mocha, carbon, and red rouge. But they’re not just beautiful and up-to-date. High gloss, non-stick panels are practical. There’s no grout to clean and reseal and unlike tile, they wipe off easily with mild soap and water. They can be quickly replenished with a liquid plastic polish. Lustrolite is resistant to UV light, scratching, cracking, warping and chipping and is 100% waterproof. If scratches do occur, they can be removed with manual buffing. The panels are light, flexible and easy to install, even by do-it-yourselfers. They can be cut with standard woodworking tools and adhere to the wall with double-sided tape and neutral cure silicone. Installation typically takes a third of the time of a tile job. Innovate Building Solutions offers free shipping and professional installation on a regional basis. The company will ship to DIY-ers at wholesale pricing. To learn more about the versatile and trendy high gloss acrylic panels from Innovate Building Solutions, call 877-668-5888 or visit www.innovatebuildingsolutions.com.